Cafeteria worker Edith Lopez preps items before lunch in the cafeteria at Mission Junior High School Thursday, January 18, 2018, in Mission. MISSION — The ability to serve at least 1,000 students at once, provide a college environment and, most importantly, cook meals in-house, are the main goals of Mission High School’s upcoming 28,700-square-foot cafeteria, school district officials said. 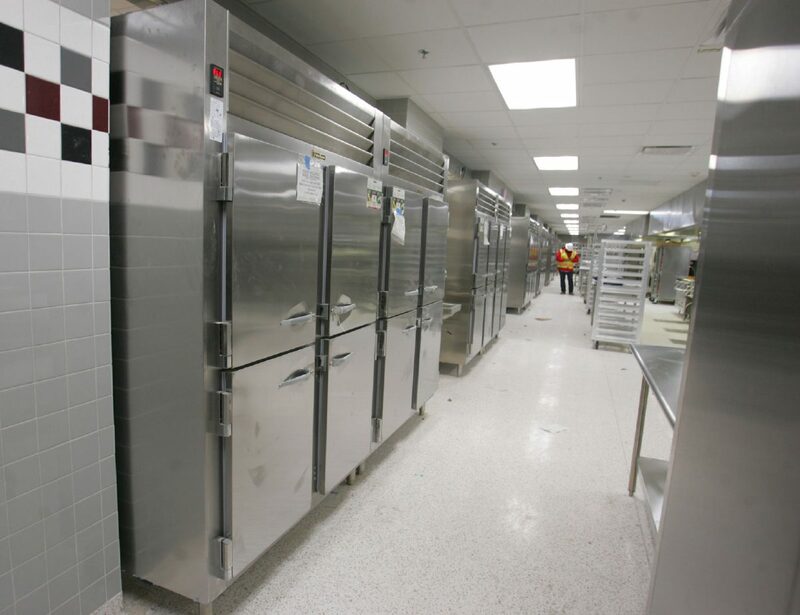 When planning for the massive $33 million overhaul of the nearly 60-year-old high school, Mission school district officials made it a point to make this the largest and second fully-functioning kitchen district wide. All of this in hopes to relieve the district’s central kitchen from some of the burden and entice more students to eat their freely available meals. 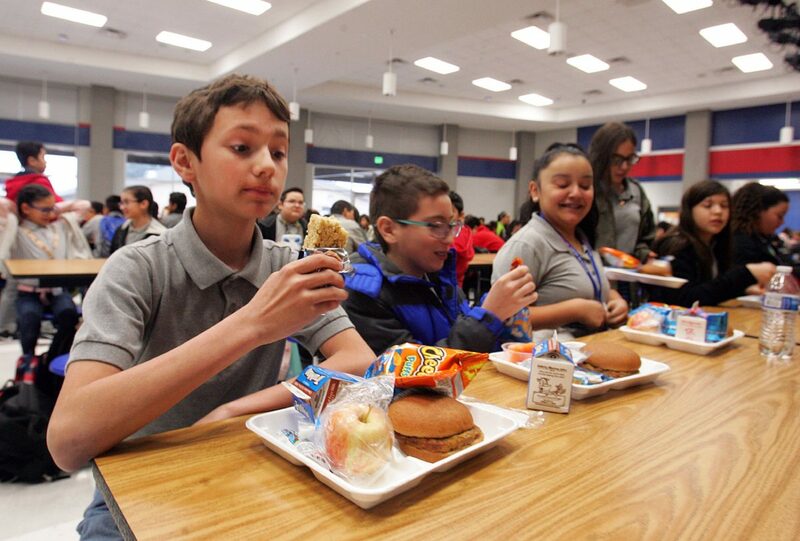 “We want the numbers to increase as far as them eating food from our child nutrition program and better the quality of the products that we are offering,” Interim Superintendent Criselda Valdez said. Tristan Aguirre, 11, far left, sixth-grader at Mission Junior High, eats his dessert first during lunch in the cafeteria at Mission Junior High School Thursday, January 18, 2018, in Mission. The kitchen of the new cafeteria under construction at Mission High School Thursday, January 18, 2018. 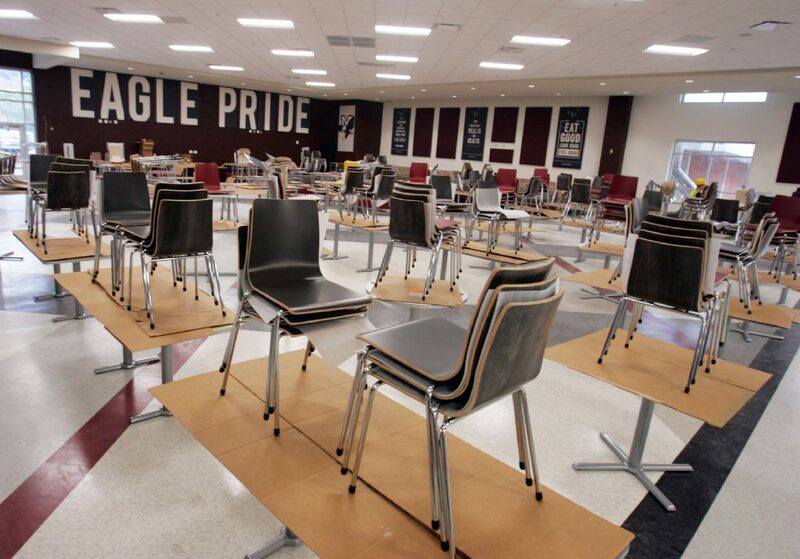 Chairs are placed on tables in the dining arena of the new cafeteria under construction at Mission High School Thursday, January 18, 2018, in Mission. 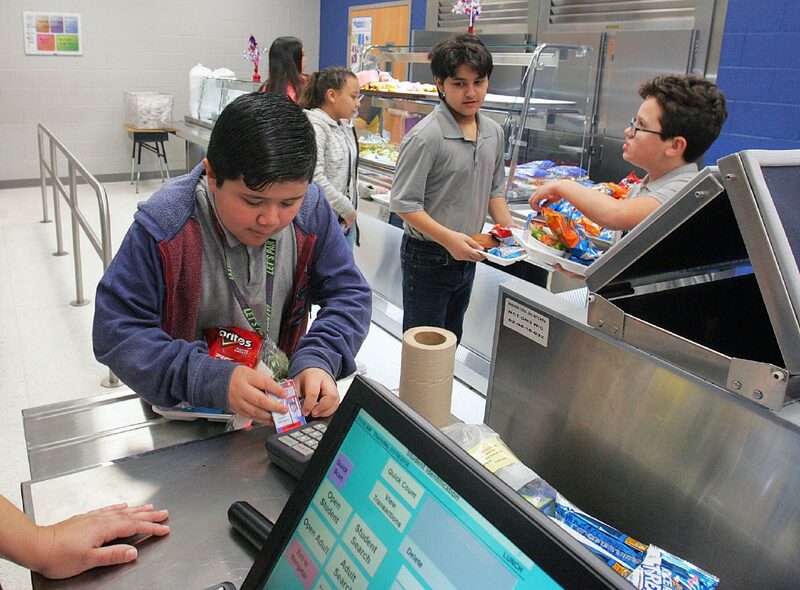 Quentin Rodriguez, 11, sixth-grader at Mission Junior High, uses his ID to obtain his lunch in the cafeteria at Mission Junior High School on Thursday, January 18, 2018, in Mission. Cafeteria worker Reyes Flores does prep work in the kitchen before the start of lunch at the cafeteria at Mission Junior High School Thursday, January 18, 2018, in Mission. The new cafeteria will count with six-and-a-half serving lines, one specifically intended for the preparation of fresh omelets, and a fully-equipped kitchen that includes industrial ovens, stoves, mixers and a giant freezer, chiller and storage, among other necessary equipment. Valdez inherited the project from former Superintendent Ricardo Lopez, who left at the end of 2017 to pursue a superintendency in Dallas. The cafeteria is scheduled for completion on or before March of this year, but no opening date has been set. Overseeing the construction of what she calls “Her Baby,” is Rosy Woodrum, director of the child nutrition program at Mission school district, who walked through the nearly finished structure last week in awe of every detail. 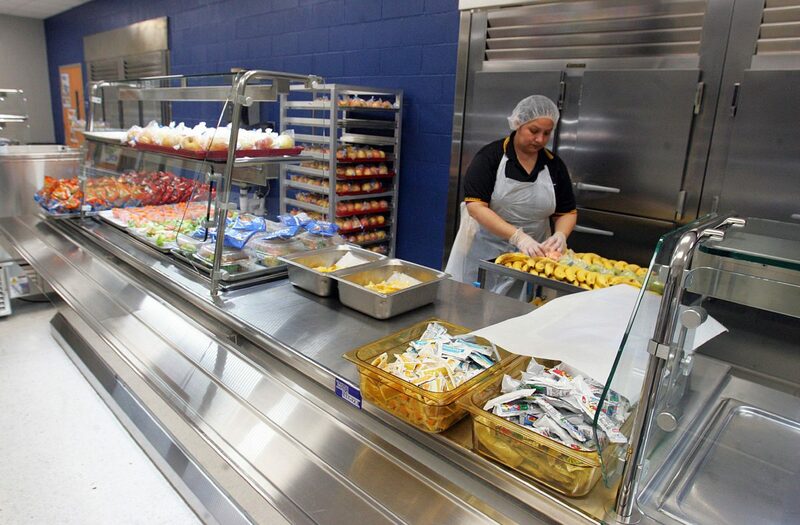 Woodrum said the idea of having a massive fully functioning kitchen is new to the school district, which has always relied on preparing its meals at the central kitchen and delivering them hot to each and every one of its 23 schools. But the model was piloted at Mission Jr. High, where a smaller-scale fully-functioning kitchen opened in October 2016 and the meal prep on sight was piloted. Even though the school district has high lunch participation, with reported 85.9 percent lunch participation and 75.7 breakfast participation, having meals that are prepackaged could deter some from viewing these as appetizing. Even as the central kitchen items are fresh, it could be all about perception. This is well known to Woodrum, who said they have seen more enthusiasm at the middle school since the pilot was launched and same is expected at the high school level. But aside from getting more children at these two schools to eat their lunch, the new cafeteria will also act as emergency backup to central kitchen, which will no longer have to worry about preparing 15,000 to 16,000 plates daily for the high school students. The new kitchen will have about 25 staffers, including cooks, servers and cashiers for the serving lines and the snack area. 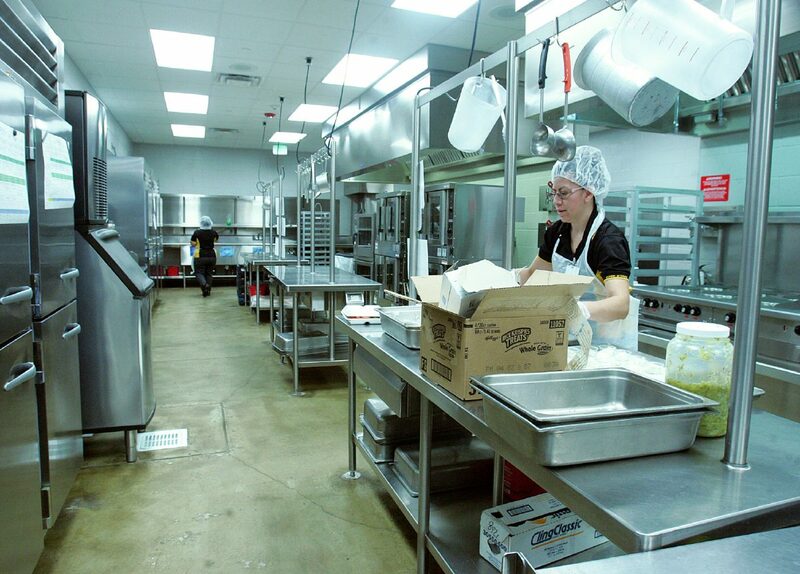 The kitchen used to operate with 16 staffers and one manager, and will add the extra nine who will be taken from central kitchen and other smaller cafeterias. Those who are not working on a fully-functioning kitchen will be trained beforehand. “What will more than likely happen is that instead of bringing things (food) from CK (central kitchen) here, we will bring some of the staff from Central Kitchen here and make sure things are ok,” Woodrum said about the training and adjustment period for the new staff. Woodrum said the plan is to start with simple recipes that children still like to eat for the first few weeks of operations then move up to more complicated meals after to allow the staff to get a feel for their new environment. Conrad Garcia, kitchen manager at Mission High for the past three years and a former student there, said it’s hard to believe this is the same school he attended as a youth. Garcia’s new office will now have a 180-degree view of the entire kitchen, including the delivery area and walk-in chiller and freezer. He knows there will be an adjustment period for everybody, but said to be confident they will all thrive with the help of central kitchen staff. Thinking back on this time managing this cafeteria, he said the most stressful part of having meals delivered from central kitchen is always making sure the food arrives warm and on time. It’s something he is looking forward to doing away with in the new digs. “For the past three years we have been making the compartment plates and bringing them in warmers. You are talking about 15,000 to 16,000 plates every day, and bring them in hot carts, which is seven or eight carts… that’s a lot of weight you are pulling. And besides that, you have to bring fruit, we got to take salad…” he said, letting out a sigh.